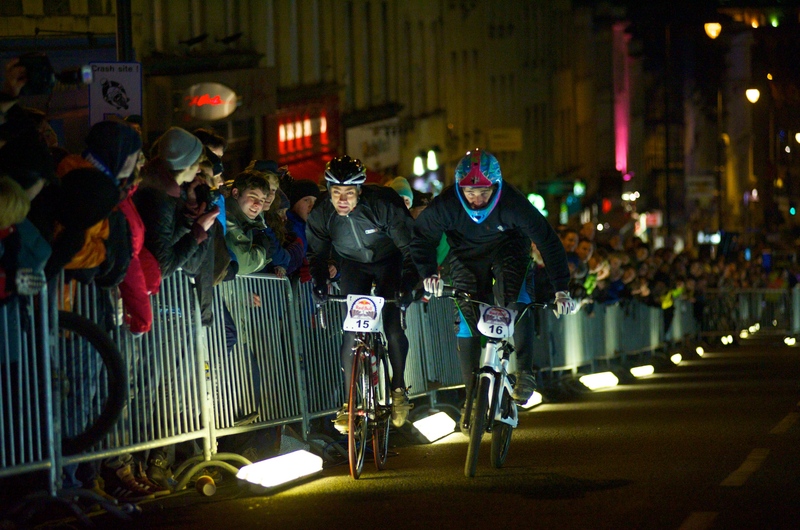 Never mind that it was freezing cold and the season is long gone; crowds three to four deep lined one of Bristol’s main shopping and nightlife streets last night to witness Red Bull’s innovative take on hill climbing. Revellers spilled out of the pubs on Park Street and partygoers stopped on the way to their shindigs to watch what was billed as Britain’s first uphill dual race. The format of the Red Bull Hill Chasers event couldn’t have been simpler for the casual passers by to understand. Two riders at a time went head to head with the winner going through to the next round of the knockout competition. Run over a straight but steepening 200m stretch of road, it was like a cycling drag race. The urban setting, sound system and big event paraphernalia added a dose of razzmatazz you’re unlikely to find at many other hill climbs around the country. Two narrow pinch points along the otherwise wide course allowed for some tactical manoeuvring while the variety of machines the 32 riders competed on made for some thrilling showdowns. The lightning speed at which BMXes sprung out of the start gate caught more than one bigger-geared roadie off their guard. Tom Palmer even made his way through to quarter finals on one. There were a surprising number of incidents too: busted lockrings on fixed wheels, crashes and a tangle with a cameraman as two riders tussled for the line. The quarter finals were as far as national hill-climb champion Dan Fleeman got to. The 200m distance being too close to an all-out sprint for Raleigh’s spindly climber. YouTube sensation – and headline act of the night – Danny MacAskill only made it as far as the second round on his trials bike. Nonetheless – for a rider who’s made his name riding along fences and jumping incredible gaps – he put on a good performance, returning back down the hill with a bag full of jaw dropping jumps and tricks. Although also billed as a battle of the bikes, riders on road machines had eliminated all those on mountain bikes, fixies and BMXs by the semi finals. Come the final, it was hill climb and cyclo-cross specialist Chris Metcalfe who put away Paul Derrick. The GP from Matlock CC stuck to his tactic of getting through the first bottleneck quickest then holding on to the line. Metcalfe is developing something of a reputation in events like this. Last year he won the Rollapaluza urban hill climb in North London.